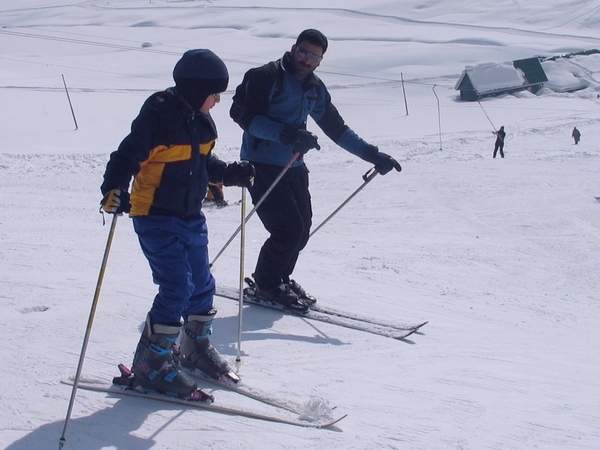 After going dune-bashing in Rajasthan, Dilshad Master-Kumar, Co-Founder Farinto.com went the other extreme and tried out skiing in Gulmarg. I never did understand why they call it the bunny slopes... until I see the kids scamper up and down with ease! While I stand tentatively on top, looking down at this "ski slope for beginners", my heart skipping more than just a beat, a little three feet nothing runt whizzes past me yelling "Chicken! Chicken! Chicken!" He is spot on. There is no way I was swooshing down that slope in one piece, but I had to give it my best shot -- part of the story gathering process for the grandkids! So swoosh I did. Like a puttering old motorbike not quite catching the starter, I stumble my way down, until the slope decides to do its job and takes me sliding down at a pace I didn't appreciate. I land in an ungainly heap at the bottom, the pride more hurt than any part of the body, look up to realise no one cared. People were having way too much fun and the serious skiers never disdain to look at the bunny slope in any case! 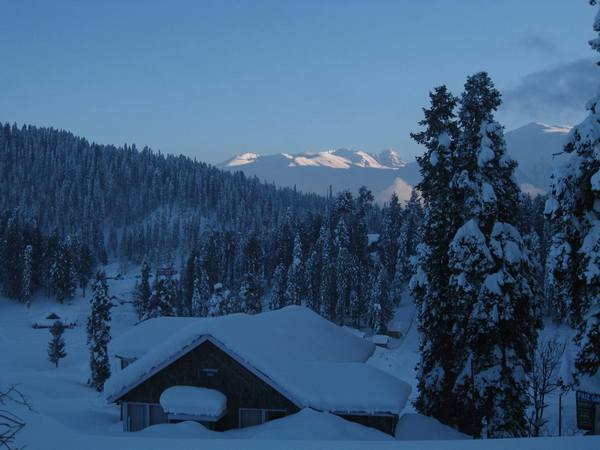 And that, in a nut shell, is Gulmarg in the winters -- some serious fun and some serious skiing. 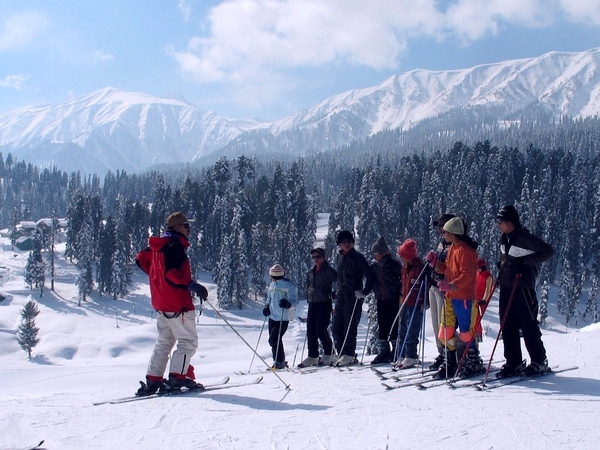 The whole world and its uncle seem to visit Gulmarg in the summers. Very few know of Gulmag's winter avatar -- the beautiful powder snow perfect for skiing and snowboarding (I'm told) and the cable car that is the highest in the world -- taking you up all the way to 13,780 feet. 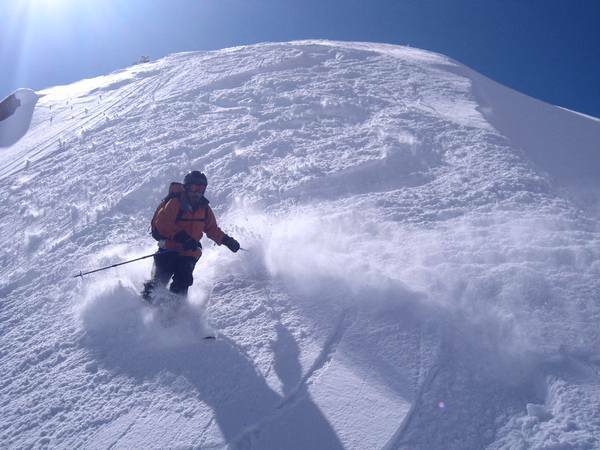 CNN International declared Gulmarg as the 7th best skiing destination in Asia and it's become the hub for snowboarders and skiers from around the world. We usually take the Republic Day (January 26) holiday and head to the "meadow of flowers" which is a sheet of white and no flowers in sight at this time of the year. And yet, the beauty of the place is breathtaking. The chilly wind hits your face the moment you land in Srinagar. The two hour drive to Tanmarg must be done with the car windows down -- the cold blast of fresh air is just divine! We head to Tanmarg not only because it's at the base of Gulmarg from where you start to climb, but also because there's Downhill Restaurant at the market corner. You get the most awesome Kashmiri Wazvan here -- gushtaba, rishta, sheek kabab, tabak maaz -- this is a meat-eater's paradise! If you're not into skiing, do what I do... simply sit on top of the bunny slopes like a diva and sip warm cups of kawa while you watch your kids go down the slopes. The young ones latch on to the ski instructions much faster than adults and within two days you will find your kids swooshing down and having the time of their lives! Or you could take a book, catch the cable car to the mid way point, sit in the restaurant there, sip some kawa (again!) and just chill. 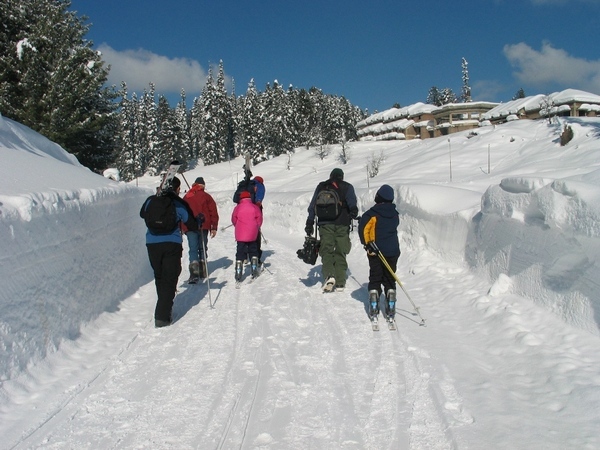 Stay close to the ski slopes in the winters -- there are lots of decent hotels around (we usually stay at Hill Top), because after an exhausting day on the slopes the worst part is a long walk back to the hotel. Do not forget to spend a night in a houseboat on the Dal Lake in Srinagar on your way back. Go to the floating vegetable and flower market early in the morning in your shikara while you stay warm snuggled up in your razai with hot kawa. Don't buy the first carpet you see from the guys who come knocking at your houseboat door and be careful if you're saffron shopping -- you could get conned very easily. From Om Beach to the Eiffel Tower: Reader's travel pics!